In 1940, the reservoir behind Grand Coulee Dam, Franklin D. Roosevelt Lake (also called Lake Roosevelt), was filling. Eventually, the rising water would cover Kettle Falls more than 100 miles upriver, erasing one of the two great Indian fishing sites on the Columbia. The other, Celilo Falls, similarly disappeared under the reservoir behind The Dalles Dam in 1957. At Kettle Falls, where David Thompson watched Indians fish for salmon in 1807, the Confederated Tribes of the Colville Reservation, descendants of the fishers Thompson encountered, hosted a three-day gathering in 1940 to eulogize the impending loss of the historic falls. Appropriately, the event was called the “Ceremony of Tears.” U.S. Senator Clarence Dill, D-Washington, a longtime supporter of Grand Coulee Dam, was a featured speaker at the event on June 16, 1940. 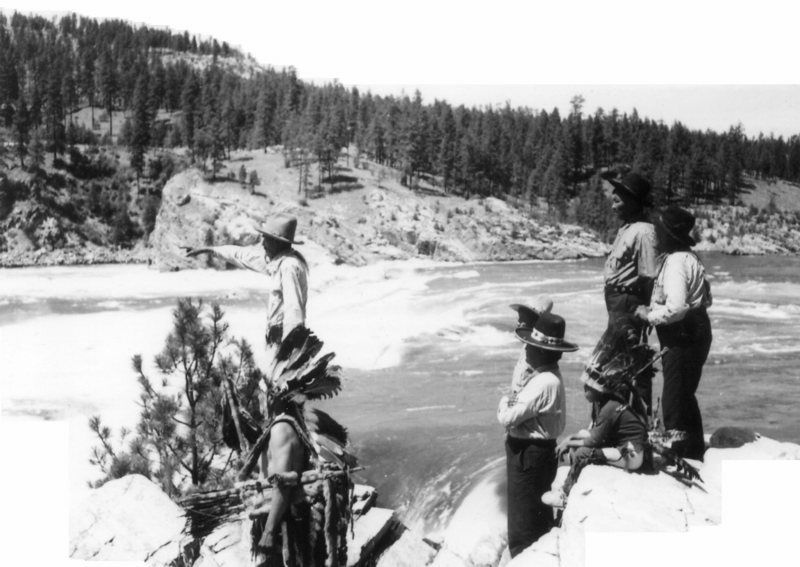 Dill also acknowledged the terrible impact the dam would have on Indians by wiping out their historic fishery at Kettle Falls, but he hoped that in the loss of the fishery the Indians would realize some benefit from the power the dam would produce. Considering the finality of the rising water and the life-altering impact the loss of the fishery would have on the tribes, the Ceremony of Tears was, in some respects, a pretty lively event. A reporter for the Spokesman-Review newspaper of Spokane estimated the attendance at 1,000. Chiefs of the San Poil, Colville and other bands spoke. There was a carnival, a dance at an outdoor pavilion featuring an all-Indian band and a Saturday night smoker where Indian and white boxers challenged each other. 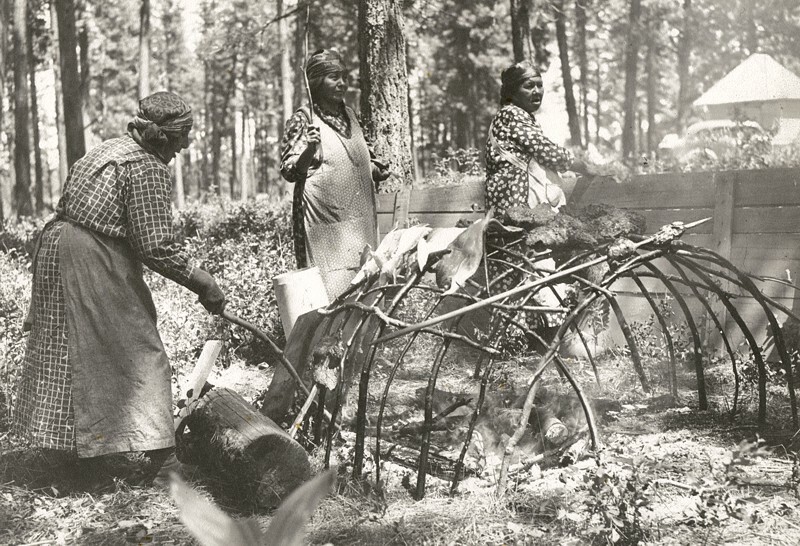 Six Indian chiefs of the Colville tribe experienced another innovation in their tribal customs when they used a loud speaker to address their people. Each chief spoke into the microphone, as did the interpreter who repeated their remarks, and all seemed to enjoy hearing their voices carried far through the pines, among which their teepees stand for the last time. Kettle Falls slipped beneath the rising waters of Lake Roosevelt on July 5, 1941. Until 1946, salmon and steelhead continued to appear at the base of Grand Coulee Dam, trying to get upriver to spawn. After 1946, none was seen at the dam again. Kettle Falls remains under water to this day, with the exception of occasional periods in the spring when the reservoir is drawn down to its lowest level. Then, for a few days or weeks, the tallest rocks of the falls peek above the surface. The water swirls lazily around these remnants, leaving patterns on the surface that dissipate quickly.